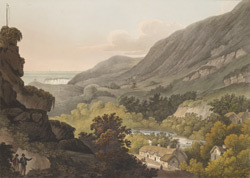 View by R. B. Harraden of Bonchurch in the Isle of Wight. Bonchurch, like Ventnor, was largely developed during the 19th century for the wealthy gentry, who holidayed in the area, enjoying the notably milder climate. Bonchurch is part of an area of natural beauty known as the Undercliff. Protected by the high peaks of St Boniface’s Down the Undercliff has a notably milder climate than much of the rest of the island. The village is renowned for the water bordering its main street, this was once part of a garden owned by Mr H de Vere Stacpoole who was a novelist. The artist is Richard Bankes Harraden (1778-1862), the son of Richard Harraden (1756-1838).